Imagine this, it’s time for the biology class and you need to cover the chapter on aquatic animals. What would you do? You’d probably show the class a few pictures, take them through a slide show or maybe show them Finding Nemo. But what if we told you, you could actually take them underwater, no parent permissions required, no extra set of clothes, you don’t even need to travel to a beach. Just put on a VR headset with a phone, play the content and you’re there. This is the power of VR. VR is a new age, immersive technology already being used in many fields; such as, gaming, real estate, architecture and more. While watching the 360° video/image the viewer gets completely immersed in the environment they are seeing. 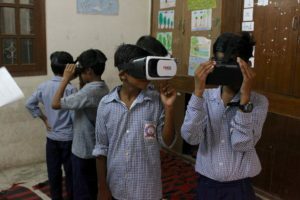 We want to use this technology in low-income classrooms to allow them to experientially learn about things that they otherwise wouldn’t have an opportunity to experience. This project aims to give students access and exposure, by creating engaging and relevant content and taking it to schools. Emerging economies need inclusive education for the large percentage of their populations that can neither afford conventional education nor fit it into the contexts of their lives and livelihoods. Can Virtual Reality be a leveler? Can this ‘elitist’ technology be a game changer in bringing education to their doorsteps?